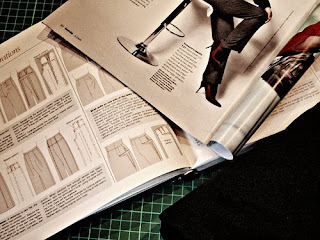 Sitting on my sewing table this week is a Burda World of Fashion pattern for some trousers. I have no real experience of making ladies trousers, but am aware that I will need to make a few alterations to the pattern. I am currently reading about how to accommodate a sway back and the kind of derriere that would be best photographed using a panoramic lens. Good luck!! Phew! yeah! Gosh! Good on you..
is an elasticated waist a sign of anything? i'm a great fan of the linen drawstring pants. so comfortable, beautifully classic and they conjure no images of middle age or (incontinence? products) ... i am getting way too old to be thinking about things like this. That sounds challenging but if anyone can do it, you can! I love the sound of pajama jeans...must check that out. Sure that your pull ons will be gorgeous. Whatever it is called, it is comfy!! Wow, those look impressive. Good Luck...I would be scared to even enteratin that thought. But you can do it no doubt! Sounds like the perfect challenge for you. Trousers with elasticated waist. Easy to sew? Yes. Easy to get a good fit? ehm, not so much. Do NOT cut into any fabric you will cry over. SERIOUSLY. Expect many versions before you get what you want. Wearable? It's quite easy to make ones that fit just as badly as the kind you can buy. So probably wearable. good on you...sounds like they will be very comfy. I am sure they will be wonderful. And they sound very comfy too. What else could you want? I'm looking forward to seeing them! There is nothing wrong with elastic wasted pants if you pull them off the right way. I'm sure they will turn out great. I can do an elastic waist for sweatpants (trackies)...that's about it. I will do an elastic waist for a skirt, though.